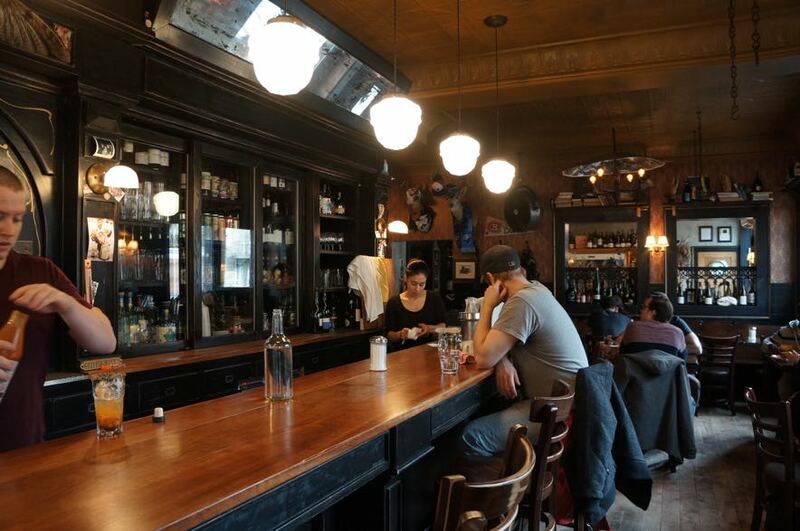 Having heard so many great things about Maison Publique, we had to drop by this quirky gastropub during our trip to Montreal. Since we already had all our dinners booked, we decided to drop by for brunch which is offered from 10:30am to 2:00pm on weekends. This gastropub opened in 2012 by Chef and Owner Derek Dammann who, in the past, worked at Jamie Oliver’s Fifteen in London. While you won’t find Jamie Oliver cooking in the back, he actually helped finance the restaurant. 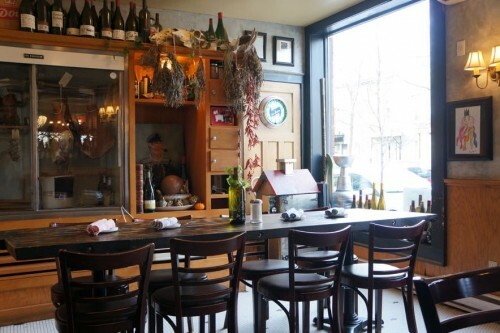 Located in Plateau Mont-Royal, Maison Publique is about a 25 minute walk from Mile End. It’s quite a trek during a snow storm which we learned the hard way. But on a mild day, it’s a nice walk and a great way to help digest your heavy meal (because it certainly will be heavy). Upon entering the restaurant, I was surprised by how large it was. There’s a long bar near the entrance, a main dining room and a smaller dining room in the back. They only take reservations for dinner so brunch is first-come first-served but if our visit was any indication, you’re probably not going to have problems getting a seat. We came by around 11am on a Saturday morning and it was less than half full. There are no printed menus here. 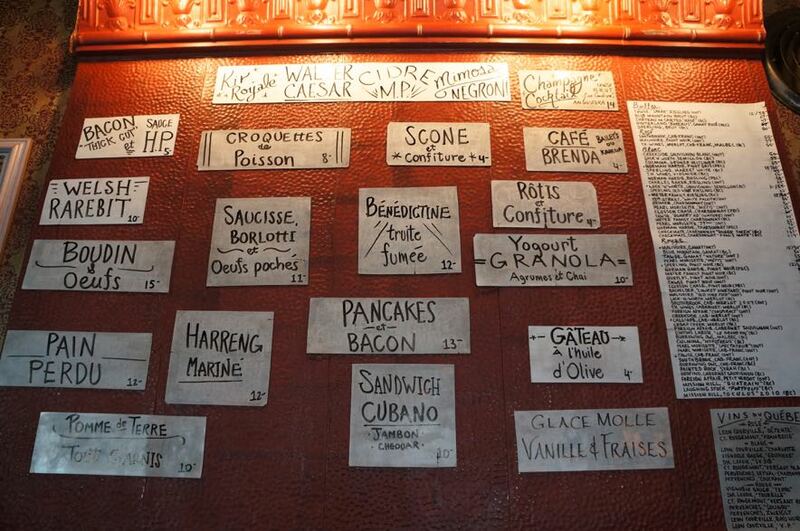 As the menu changes regularly, their offerings can be found on the large board in the main dining room. It’s all in French but the servers are happy to answer any questions. I ordered the Boudin & Oeufs ($15). 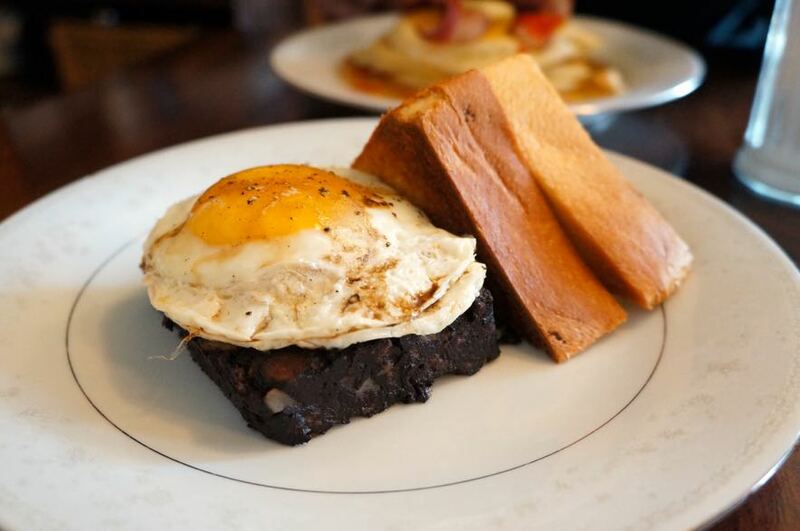 The dish consisted of a thick slab of blood sausage topped with a perfectly fried egg and a side of buttered toast. 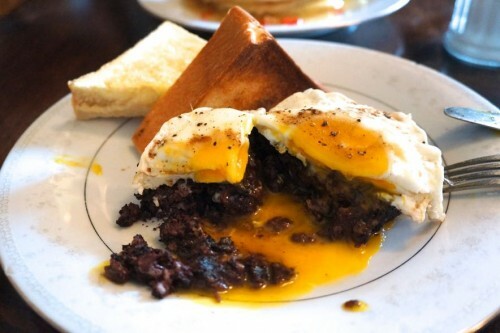 I cut into the gooey yolk which soaked up nicely into the blood sausage. There were a number of instances where I’ve had dry and crumbly blood sausage but this certainly wasn’t the case here. It was incredibly moist and I was able to detect the different offal components as opposed it being one homogenous block. Two thumbs up! Mike ordered the Pancakes & Bacon ($13) which was another stellar dish. The dish came with several stacked pancakes drenched in maple syrup and topped with bacon. 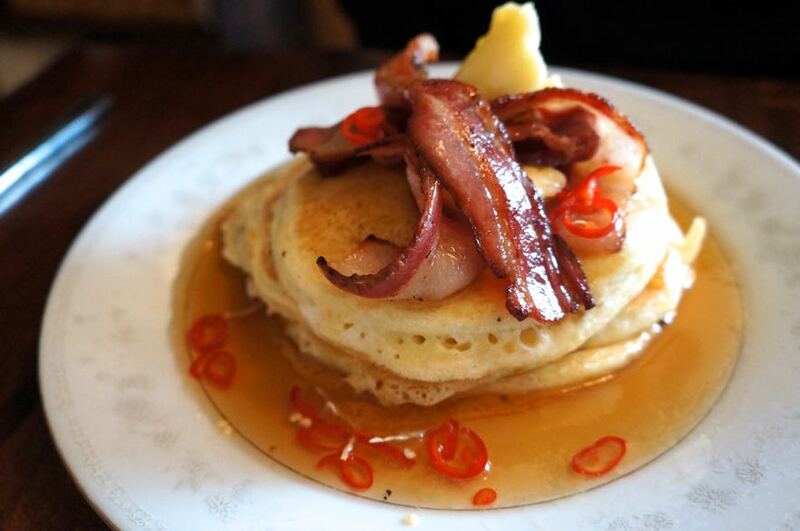 The pancakes themselves were amazing – each bite had a very buttery flavour. The maple syrup, which had a hint of chili in it, was also excellent. It had the tiniest amount of heat to it but there was just enough so that you knew it was there. I love a good sweet and savoury combination so the bacon was a great addition. We couldn’t have been happier with our brunch choices. We’ll definitely be back next time for dinner!